John Franklin McAfee, 45, passed away after a long battle with Huntington’s Disease on May 6, 2016 in Pawleys Island, SC. 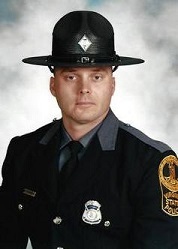 John was a retired Senior Trooper and a member of the dive and recovery team for the Virginia State Police. John served in Henry County and Northern, Virginia. John was also a former Deputy Sheriff with the Henry County Sheriff’s Department. John was born in Chattanooga, Tennessee on April 15, 1971. He attended Tarleton State and Hardin-Simmons Universities in West Texas and played football for both schools. John is survived by his loving wife of 19 years, Susan Jackson McAfee; parents Joseph and Deena McAfee of Bland, VA; in-laws Arthur and Kathy Jackson of Pawleys Island, SC; one sister Shelley McAfee of Big Stone Gap, VA; one brother, James McAfee of Wakefield, KS; two nephews Joshua Hall of Athens, GA and AJ Jackson of Wake Forest, NC; two nieces Olivia and Katelin Jackson of Wake Forest, NC; grandparents Charles and Elaine McAfee of Chattanooga, TN and Louise Yates, Gastonia, NC. Prior to his illness, John loved running, hunting, and fishing, but was most proud of his accomplishments and service in law enforcement in Virginia. John was a life long Southern Baptist. Memorial service will be held at Belin Memorial United Methodist Church, in Murrells Inlet, SC, Saturday, May 14, 2016 at 11:00am. In lieu of flowers, donations can be made to Caring Voice Coalition 8249 Meadowbridge Road, Mechanicsville, VA 23116, who helps meet the needs for people with rare, chronic or life threatening illnesses, www.caringvoice.org or Huntington’s Disease Society of America, www.hdsa.org.